. Digital Toys for a Digital World . Second Life is an online virtual world with a functioning virtual economy, designed and built by its users. These are the toys and tools I have built within Second Life. I build everything from Fedora's to Killer Robots to Telekinesis HUD's; My top selling products over the years have been the Tornado HUD and the Dark Force HUD. I pride myself on the quality of my products and customer service and my product reviews speak for themselves! You can also view all my products on the Second Life Marketplace and see my main product videos on my Youtube Channel. 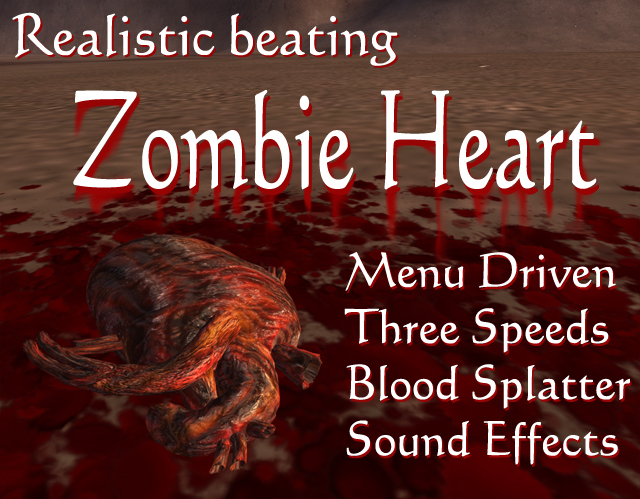 The zombie heart is a highly detailed and realistic menu driven sculpted heart. When clicked a dialog menu will pop up with options to turn the sound, blood spray and lighting on or off, change the bpm (beats per minute), and start and stop the heart! When rezzed the four jets of blood will splatter realistically on the ground (Please Note - The blood splatter works on the ground only, not on the surface of objects). It also comes with a spiked "stand" with dripping blood to keep to heart in one place! If you wear this as an attachment, the particle effect blood spray will still function, but the rezzed blood splatter effect will not appear on the ground (This is due to limitations in SL; Finding the correct regional positions of attachments is not possible and is required for the splatter effect to rez in the right place! ).